I have started facilitating a small bible study group. Seeking biblical answers for the questions of eager learners inspires me to dig deep. Developing the necessary kingdom mindset that can be difficult for most of us. In class we were discussing the scriptural principles of reaping and sowing. Scriptural principles are constant whether we are aware of them or not. When I plant wheat, wheat is what I expect to harvest. The same is true in the Spirit. When I plant God’s word, from that word comes life through Jesus Christ, The Word. For over forty years me father was a heavy smoker, until he developed emphysema. Though he quit smoking the disease took his life. We could call this an equation that looks like this. In the natural world, we see this math at work constantly. Adding unfaithfulness to marriage produces divorce. Drinking plus liver disease leads to cirrhosis and death. Negligence in areas of finance leads to poverty. Add God to any equation and the outcome changes. “David stayed in the desert strongholds and in the hills of the Desert of Ziph. Every negative in our life is a horizontal reality. But when God is added everything changes! “…for which I am suffering even to the point of being chained like a criminal. This list is not exhaustive. I hope it is enough for you to begin to appreciate the many “but God” verses as much as I do. As soon as I see those two words, I know that everything is about to shift. Something supernatural is about to happen! When I reason along the natural plain of this world, 1 + 1 will always equal 2. But when I allow vertically thinking and a new mindset, there is a shift. I consider the negative realities fully and rationally. However, human reason no longer dominates. Abraham’s faith created the vertical alignment set over his horizontal reality of life. As a believer we don’t ignore the facts! We simply apply faith over every fact confronting us. Now Abraham took his number one fact, “his body was as good as dead”, with Sarah’s number one fact. One plus one! He plunked faith firmly in the middle, overlaying horizontal reality with the vertical truth of “but God“. Now fact, reality and faith were firmly connected! 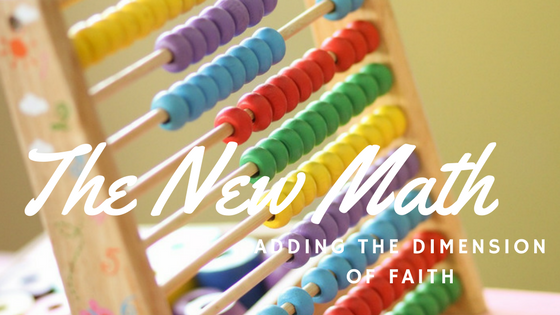 Now through the vertical dimension of faith, “2” is not the “natural” outcome to the equation. Rather, faith creates before us a window through which light and life can flow freely. To see God’s potential reached, we aim for His mindset. In becoming more and more aware of His thoughts and His character, the Lord will enlarge our thinking to creative abilities and heavenly mindsets. One plus one may just mean a new window of opportunity, growth or direction for you and those around you! Take this moment to ask God what your one plus one equals in His sight. You might be surprised! ← Laughter – It’s Better Than Medicine! Choose Joy!